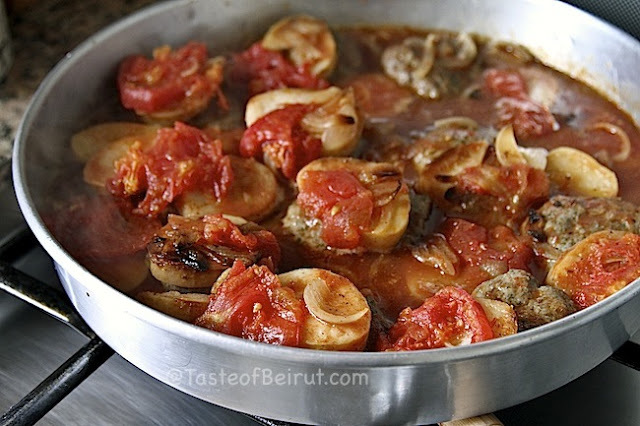 A comforting Lebanese casserole of Kafta with potatoes, onion and tomatoes baked and served over a white vermicelli rice. 1. Make the kafta mix by placing the meat, chopped parsley, onion and spices in the food processor and running the machine till the mixture is pasty. Transfer to a bowl and form patties. Heat the oil in a skillet and fry the onion slices then the patties (about 3 minutes total) and transfer to an ovenproof plate. 2. Peel and cut the potatoes into slices about 1/4 inch thick; slice the tomatoes as well. Place the potatoes over the kafta patties, and top these with the tomato slices; pour the tomato juice over the dish, sprinkle the spices and pomegranate molasses or lemon juice. Bake in a 350F oven (covered in foil) for about 40 minutes or until the potatoes are cooked. Serve. NOTE: Kafta mix: 1/2 lb lean ground beef or lamb or a combo, 1/4 cup chopped parsley and one small onion, chopped. Place them in the food processor with 1/2 tsp salt, 1/2 tsp allspice and 1/4 tsp cinnamon.